This is a proposal to use satellites to reflect the sun’s light to designated areas on Earth. This would be a commercial service sold, perhaps on a nightly basis, by the satellite owner. Satellites which have line of sight of (1) the sun, and (2) an area on Earth where light is needed, can be directed with radio signals to reflect sunlight to the desired location on Earth. The satellite would be launched with a folded Mylar mirror. 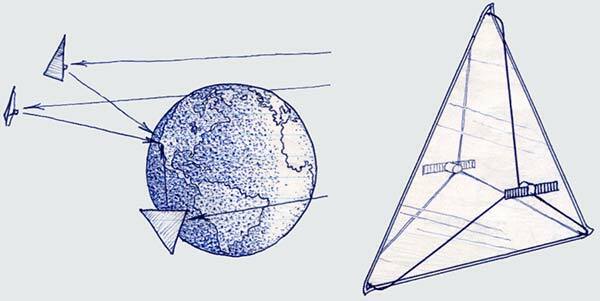 Once in orbit, the mirror would deploy into a large flat triangular sheet, held in tension at the corners, envisioned to be approximately 200 ft. on an edge. 1. To illuminate nighttime outdoor concerts. A musical group on a world tour could book a satellite to follow them from city to city. 2. To illuminate construction sites. 3. In lieu of a helicopter with a searchlight, police could call up a satellite reflector to illuminate an area where they were chasing a fugitive. 4. Search and rescue crews could direct as many satellite reflectors as necessary on someone who is snowbound to provide life-saving heat. 5. The military could use satellite reflectors to pinpoint the enemy on a battle field as a visual reference for the pilot, or to guide heat-seeking weapons. 6. Film production companies could use a satellite reflector as an artificial sun in remote locations, or multiple satellites to reduce shadows. 7. To direct light to photovoltaic cells on the ground, or to other satellites, to extend the productive time to produce electricity. 8. A cluster of geo-stable satellite reflectors, or perhaps a ring of satellites encircling the Earth, could collectively provide a very-large aperture radio telescope, providing an extremely high-resolution radio image. This is a technology announcement and an example of technology that consulting clients can expect from HinesLab, not a product being offered for sale. HinesLab currently offers consulting and novel solutions to your problems as well as a variety of licensable technology.